Jack Yan is a 12th generation Chen’s Taichi inheritor – one of the eighteen inheritor disciples of Grand Master Chen Zhenglei (a major gate keeper of Chen’s Tai chi). He currently holds 7th Duan of Chinese Martial Arts and a Ph. D. Degree in Chinese Martial Arts from Shanghai University of Sport under Professor Qiu Pixiang (One of the Top Ten Wushu Professors of China). He obtained his master degree in English Language and Literature from Institute of International Relations in Beijing and his master degree in Political Science from University of Western Ontario in Canada. Jack Yan founded and held the position of president of Taishan School of Martial Arts from 1993 to 2010, based in Richmond Hill, Ontario, Canada and he is the president of Chinese Wushu Academic and Research Association, Ontario, Canada. For over twenty years, Jack Yan has been teaching Tai chi and other styles of Chinese martial arts and meditation systems in Canada. Jack Yan grew up in Hegang (鹤岗), a coal mine city in Black Dragon River Province (黑龙江). He survived the great famine in late 50s and early 60s and his 9.5 years of primary and high school covered exactly the years of the Great Cultural Revolution. He was mostly home schooled. He was lucky enough to have well educated parents who had a cellar full of thousands of books from red letter head government documents, Chairman Mao’s Red Books to books like Wuthering Heights, Great Expectations and War and Peace. He read most of the Chinese classics in their original old Chinese. During his primary and high school years, he was better read than most of his teachers. That might not be a good thing because the teachers really disliked him. He was even beat up by a couple of teachers. While he did not do much learning in school, he had a lot of time playing. Being two or three years younger than his classmates, he was an easy target for the older and bigger kids. Running away from physical bullying was a daily event. Learning Martial Arts was not a hobby. It was “survival” though ironically he was not allowed to fight back by his martial arts teacher. No one knew he was able to defend himself until one day he was picked on by a classmate in front of a girl he had a crush on. Oh boy, that classmate remembered how it felt getting beat up by an angry kid who knew Kung Fu. It happened right outside of the classroom at the end of the building. Yes, that is a picture of his high school in mid the 1970s. Those years were a mixture of struggling and blessing. Starvation and bullying were a constant pain, but the reading, playing music and training in Kung Fu were real joy. Graduated in 1976, Jack became the youngest high school teacher at the age of seventeen. In a very short period of one year, he taught Music (had a school band), Chinese and even Political Science. He was also “on loan” to a local performing company playing French horn on a Henan Yu Opera (河南豫剧) show. One of his Kung Fu teachers was Master Li Shaolong who trained in Shaolin Style Kung Fu. Master Li had a born gift of tremendous physical strength and was also a highly achieved martial artist. He recognized the same gift in Jack. Jack could lift more than his own body weight naturally at a very young age. At times when he could not get away from the bullies, he would just lift his attackers up in the air until they promised not to beat him up. He had another teacher who had an important influence on him – his Erhu (二胡 Chinese fiddle) and Qigong teacher Zhang Shuxue. He learned a great deal on how to find himself in music and in his own mental tranquillity. During a time when everyone was going nuts in a political turmoil, Jack was considered blessed with good parents, friends and teachers. While the early reading definitely widened his vision, it was the one year he spent in Beijing attending the Institute of Ministry of Coal Mine Administration Cadres (煤炭部干部管理学院) that showed him the world outside of the small town Hegang. In 1979, he went to Dalian Institute of Foreign Languages where he spentfour years studying English – talking about changing life directions. In Dalian, Jack met Professor Miao Fusheng (苗福盛) who was four times national champion in Praying Mantis Boxing (螳螂拳). Professor Miao graduated from Shenyang Institute of Physical Education majored in Wushu and was and still is a highly respected martial arts figure in Dalian. Although Professor Miao specialized in Praying Mantis Boxing, he suggested Jack to specialize in Tong Bei (通背拳). His comment was “You are no good in Praying Mantis, but you are natural in Tong Bei. You already have the body condition of someone who trained in Tong Bei for twenty years!” That was enough reason for Jack to go crazy in his Tong Bei training. Professor Miao found two Tong Bei teachers for Jack – Master Zhang Xianli (张献礼) and Master Cao Jianchen (曹建臣) while he himself continued to train Jack in general Kung Fu, Chen’s Taichi and free style combat. From 1983 to 1985, Jack Yan worked in Fuxin Institute of Mining Technology (Now: Liaoning Technical University) as an English teacher. It was a government assigned job and Fuxin was not the favourite place for most young university graduates. He survived the two depressing years by preparing for his grad school entrance exam and training in Kung Fu like a maniac. In the summer of 1985 when he got accepted into Beijing Institute of International Relations as a graduate student, he weighed not much over 100 lb at 5’8″ tall after two years of less than 5 hour sleep every nights, ten (10) litres of strong black tea a night and a crazy studying and training schedule. He was light weight and happy. In mid 1980s, Qigong became a popular thing in China. Jack met and studied from a few qigong masters in Beijing. He had the fortune of meeting Qigong Grand Master Zhang Mingwu (张明武) who guided him to the right path of Qigong study and practice. 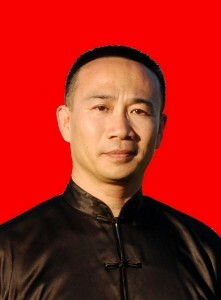 GM Zhang Mingwu was the founder of Self-Healing Qigong and an honorary Chairman of Chinese National Qigong Association. His took an un-mystified approach to Qigong practice. He taught many to study Qigong in a scientific manner and helped tens of thousands people recover from illnesses and diseases. After two years graduate school and one year working at the Institute of International Relations as an English lecturer, Jack came to Canada in 1988 to pursue his degree in Political Science at the University of Western Ontario. He wasn’t a terribly good student in Political Science but he was quite well known in the university as the Tong Bei master. 1988 marked the year of his Canadian Kung Fu practice. As a new immigrant, Jack washed dishes, delivered Chinese food, cooked as a line cook and a chef, pumped gas, weeded on a ginseng farm, managed an auto garage and a couple of restaurants, but his passion for Kung Fu never diminished though he had no time to train much. In 1993, with the help of Mr. Shen Chew and Mrs. Lee Chew who were studying Chen’s Taichi with him, he opened his own Kung Fu club in Thornhill called: Taishan Internal Arts Club. The rest was history. In 1996, he became a student of Grand Master Xu Gongwei (徐公伟) who was a student of Grand Master Chen Zhaokui (陈照奎). GM Xu worked with him mainly on the Chen’s Taichi New Frame series. He learned not only Taichi techniques but also the ways of being a martial artist. In 2005, Jack became a disciple of Grand Master Chen Zhenglei (陈正雷) who is a main gatekeeper of Chen’s Taichi, 9th Duan in Chinese Martial Arts and officially accredited as one of China’s Top Ten Contemporary Chinese Martial Arts Masters. Shortly after in 2008, he became one of the first eighteen In-Chamber Disciples of GM Chen Zhenglei. He translated and published GM Chen’s complete Chen’t Taichi Series. Academic advancement is a never ending endeavour for Jack Yan. He went back to school again. He was lucky to become Professor Qiu Pixiang’s (邱丕相) Ph.D student. Prof. Qiu is 9th Duan in Chinese Martial Arts and officially accredited as one of China’s Top Ten Contemporary Wushu Professors. In 2011, Jack Yan successfully defended his thesis and was awarded the Phd. Degree in Chinese Martial Arts by Shanghai University of Sport. With great anticipation and renewed energy, Jack Yan relaunched his Kung Fu school as TNT KUNG FU SCHOOL in 2013 in Markham, Ontario. At TNT KUNG FU SCHOOL, there is a team of highly qualified instructors. They all have years of training in Tai Chi, Kung Fu and Qi Gong under Jack and other teachers. 1965 – 1979 Studied traditional wushu and grappling from Master Li Shaolong. Studied Erhu (music instrument – Chinese fiddle) and Qigong from Master Zhang Shuxue. 1979 – 1983 Studied Tongbei Boxing, Chen’s Taichi and Yang’s Taichi from Professor Miao Fusheng who won four consecutive national wushu championships. Studied Tongbei Boxing from Master Zhang Xianli and Cao Jianchen. 1986 Studied Self-control Qigong from Grand Master Zhang Mingwu who was the honorary Chairman of Chinese National Qigong Association. 1996 Studied Chen’s Taichi from Grand Master Xu Gongwei who was a student of Grand Master Chen Zhaokui. 2005 Became the in-door disciple of Grand Master Chen Zhenglei and formally accepted as the 12th generation Chen’s Taichi disciple. 2008 Became 1 of first 18 in-chamber disciples of Grand Master Chen Zhenglei and formally registered as the 12th generation inheritor of Chen’s Taichi. Inherited the family name: Chen and given the name: Deyan. 1988 Opened a student club for Chinese Kung Fu at the University of Western Ontario teaching Tongbei Boxing, Taichi and Self-Healing Qigong. It was the first martial arts club in London Ontario that teaches Modern Chinese Wushu, traditional Yang’s Taichi and Chen’s Taichi. 1992 Taught at Samurai Club in Richmond Hill Ontario as senior instructor teaching Chen’s Taichi. In the same period, taught classes in Tongbei Boxing and Chen’s Taichi at Cold Mountain Dojo – a dojo run by Professor David Mott. The dojo was provided by Professor David Mott free of charge to promote Chinese Martial Arts. All students studies at Cold Mountain were veteran martial artists and many were instructors. 1993 Founded Taishan Internal Arts Club, specializing in Modern Chinese Wushu, traditional Chen’s Taichi, traditional Yang’s Taichi, Tongbei Boxing and Self-Healing Qigong. 2006 Founded Chinese Wushu Academic & Research Association. Simplified 24 Forms Taijiquan, video, Taishan Club, 1994. Chen Style Taijiquan New Frame Routine One, video, Taishan Club, 1994. Yang Style Taijiquan 85 Forms Routine, video, Taishan Club, 1994. Walk to Health – Dynamic Qigong, Taishan Club, 2001. The Eight Immortals Sword, 2nd Ed, Taishan Club, 2007. Whip-Stick, 2nd Ed. Taishan Club, 2007. Complete Public Curriculum of Chinese Wushu, Co, Auth. Xu, Yanguo, Taishan Club, 2005. Trans. Chen Style Taijiquan New Frame Routine One – Chen Zhenglei, World Alliance of Chen Zhenglei Taijiquan, 2007. Traditional Tongbei Boxing, Taishan Club, 2007. Trans. Chen Style Taijiquan Yang Sheng Gong – Chen Zhenglei, World Alliance of Chen Zhenglei Taijiquan, 2008.